"Timeless Love: Romantic Stories that Span the Ages" an anthology that features seven amazing authors! Book Description: This 7-novella romance collection will only be available until the first week of July, and then it will be "unpublished" from sell sites. *The ebook edition of the collection will remain on the buyer’s device after the ebook is disbanded. My thoughts: It is always fun to find new author's. 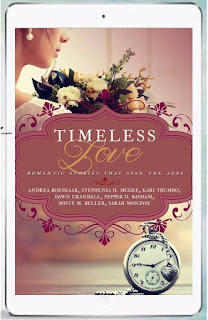 This anthology was written by seven Christian authors, five of them were new to me. It appears that all of the novella's are tied to series that the author's have written about, or are in the process of writing about. If you are looking for potential new reading material and authors, this is a perfect way to try them out. Each of the stories are very different. You have Regency romance to a couple living in a shack, surviving through blizzards, in Canada. This is really a collection to be savored and enjoyed. Some of the stories resonated more with me than others. There were a few that if reviewed on their own would have been given 5 stars, but none of them would be less than four. This book contains novella's. Usually I love a longer story that has time to develop characters and delve into the plot. I felt that each of the stories were a good length. I wasn't left wishing that the author had given me more. I was satisfied and felt that the stories were complete. This book contains a non-graphic violence, humor, kissing, and Christian themes. Pre-order you copy today for 99 cents! Featuring one of the Authors: Dawn Crandall’s debut Gilded Age Victorian romance, The Hesitant Heiress, was a 2015 ACFW Carol award finalist in the debut category and received the 2015 Gayle Wilson Award of Excellence, the 2015 Write Touch Reader's Choice Award and the 2015 Romancing the Novel Reader's Choice Award. Her follow-up novel, The Bound Heart, received the 2016 Laurel Award from Clash of the Titles. Dawn earned a BA in Christian Education from Taylor University. 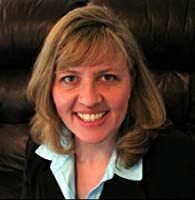 She’s been balancing books and babies lately as her two sons were both born as the first four books of her Everstone Chronicles series were being released from Whitaker House from 2014 to 2016. Dawn lives with her husband and two young sons on a hobby farm in her hometown in northeast Indiana. Book Description: Bree Mercer is an ambitious sports reporter who has risen through the ranks to land her dream job. Basking in the sun, sea, and seriously cute guys in her new singles ward, things couldn't be better. That is, until she's assigned to write a feature on the one person she can't stand—professional beach volleyball player Kade Townsend. A typical cocky athlete, Kade's previous attempt to woo her was foiled by Bree's hard-and-fast rule: don't date athletes. Ever. My thoughts: This book is adorable! The characters couldn't be more fun and good for each other. They have obstacles to overcome, but in the end, I was very happy to have them get together! 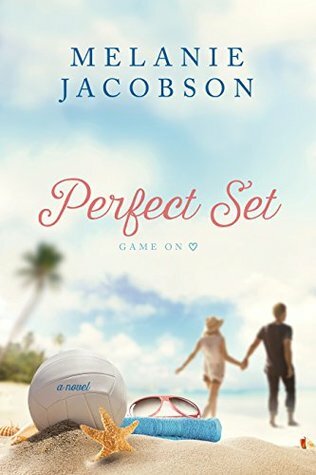 If you love a fun book about imperfect people, taking a tough road to romance, I think you will enjoy this book. It contains kissing and religious situations. 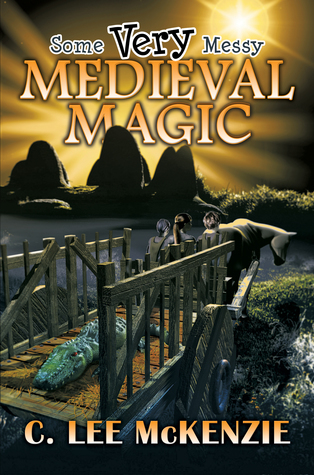 Book Description: Pete’s stuck in medieval England! My thoughts: It was fun to enter the world of Pete and Weasel. This is a middle grade fantasy that is set in the modern world and medieval times. Pete and Weasel are two young boys who are friends and help each other get out of tough situations. This is a great series for young readers. As an adult, I enjoyed it too. My thoughts: When I asked for this date to review, there were a couple of things that I forgot to take into consideration. First, today is my son's graduation from High School. Second, this is the last week of school. I am a lunch lady and we are cleaning and closing down the kitchen for the summer. This makes an incredibly busy week for me, and I did not finish reading the book. My plan was to stay up all night if needed to read the book, but I fell asleep. So.... I am really liking the book so far. The characters a likable and I enjoy Melanie Jacobson's writing style. My plan is to have the book finished later to day. (Crossing my fingers) I hope to have the review up tomorrow and reference back to this post, because it does contain a giveaway. Anyway, hope you all have a great day and I will be posting pics on my personal social media accounts about my day today. I LOVE the Timeless Regency Collections! Well, really anything that is a Timeless Collection. This addition comes out in August. Source: Received from publisher for review. Book Description: A follow-up to Josi S. Kilpack's bestselling Proper Romance title The Vicar's Daughter. My thoughts: Miss Wilton is a joy to read about. She is a strong woman who hides beneath her insecurities. She has a strong heart and mind, but is timid and doesn't express herself often enough. This is the second book that has her as a character, but you can read this without the first. This book references the other with a failed engagement and the social stigma that it caused. 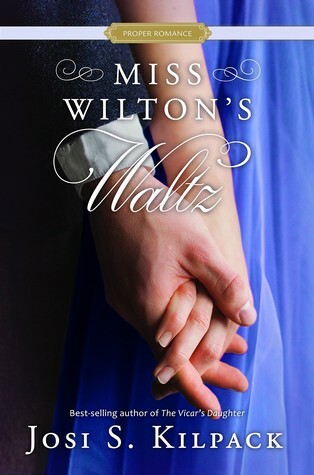 In "Miss Wilton's Waltz" she finds love and romance. The relationship between Lenora and Aiden is rocky at best. It doesn't begin on the best of circumstances and there is a long and difficult road ahead before they can find a "happily ever after". I enjoyed the addition to Aiden's niece, Catherine. She definitely stirs the pot and is a little too smart for the adults around her. She knows how to keep them guessing. She also has some real struggles that take a compassionate adult to address and help her. This was a great book to read. It is clean with kissing. Dating the Prince by Alina Snow Small-town girl, Katie O’Connor has always dreamed of seeing her name in lights. Check the box for fame, a movie deal, the perfect leading role that comes with a gorgeous leading man! Katie moved to Hollywood, elbows her way into auditions, lives on a shoestring budget—whatever is required to land a deal, she throws her heart into… until she’s involved in a royal kidnapping. Book Description: Haley has always admired her strong-willed great-grandmother Grisa. The woman survived the disappearance of her husband and thrived after her immigration to America at the beginning of World War II. 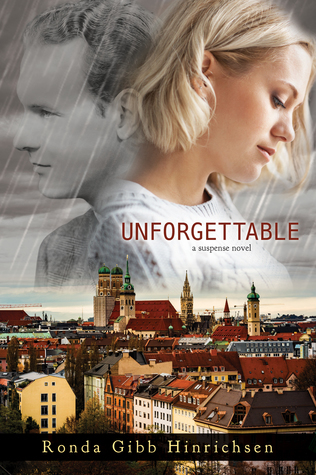 But when a shocking telephone call from a detective in Germany turns Haley's life upside down in an instant, she finds herself questioning everything she thought she knew about her heritage. My thoughts: Secrets that carry through generations is a big part of this book. It begins as a young husband and father is murdered before WWII. A young boy is forced to take part. Then the book comes to the present day when the remains are uncovered. Haley loves her great-grandmother, Isle. Her grandmother is on hospice when the word comes of her husband's death. In order to fulfill her dying grandmother's wish, she travels to Germany to take care of the remains of her great-grandfather. What should be a simple and straight forward task becomes dangerous when there are secrets buried with her great-grandfather. This book has plots within plots. Unscrupulous men will do anything to hide their sins, even decades later. This book covered generations, the tragedy for the Krauss family from never knowing what happened to Ulrich, and the tragedy of bringing up children with a life of crime. Both actions impacted the lives of their descendants and influenced present day actions. It is a fascinating thought to me, the role that families play in each others lives. This book alternates between Haley and the villain, Otto. Innocence vs. deception. I enjoyed reading the pieces falling together for Haley and the measures that Otto was willing to go to keep his families secrets hidden. This book fascinated me. It does contain violence. Ulrich's death at the beginning was a little disturbing to me, mainly because it was told from his point of view. Book Description: The roads in and out of Paris are heavily guarded, but the dead have easy passage out of the city. A ragged old woman transports the coffins of the most recent victims of the guillotine and is waved on unimpeded. Later, the same crone watches five French aristocrats step out of their coffins unscathed. Not beheaded but spirited away to safety by that most elusive of spies: the Pimpernel. 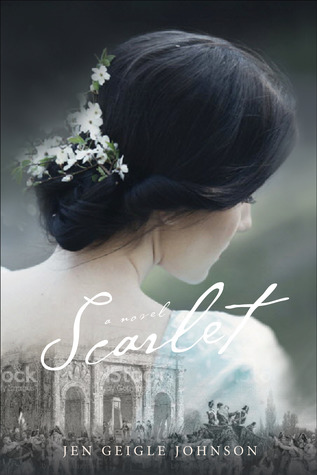 Or, as she's known in polite society, Lady Scarlet Cavendish. My thoughts: I love history. It fascinates me. I wish that I had been a better student and taken the time to learn more when I was in school. Most of the history I read comes from historical fiction. I do google names and places and try to learn more as I read the book. This one had me visiting Google often. I wanted to know more about the non-fiction characters and their role in history. 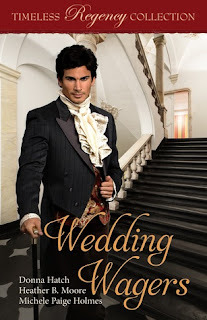 This book is a retelling of the "Scarlet Pimpernel" by Baroness Orczy. I can't say that I read the original, but Google.... I was able to pick up immediately what sets this book apart from the original. The Pimpernel is a woman in this story, the original was a man. I am grateful for this twist, I love a strong female heroine. Lady Scarlet Cavendish is a paradox. To the ton, she appears a frivolous and selfish woman. But to the French nobility, she saves them. She is level headed when faced with danger and is selfless in so many ways. I would love to know more about this time period. Maybe someday.... I may get the chance to learn more, I hope so. Until then, I'll just keep reading Jen Geigle Johnson books and let her research some fascinating time and people and ignite my imagination once again. This book contains kissing and violence. 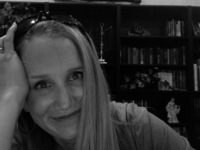 About the Author: (Taken from Goodreads) Jen Geigle Johnson once greeted an ancient turtle under the water by grabbing her fin. Other vital things to know: the sound a water-ski makes on glassy water and how to fall down steep moguls with grace. No mountain is too steep for her to climb, yet. During a study break date in college, she sat on top of a jeep's roll bars up in the mountains and fell in love. She discovered her passion for England while kayaking on the Thames near London as a young teenager. 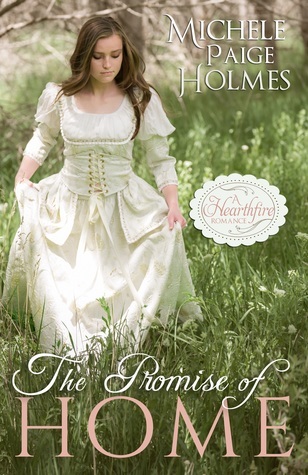 Do you want to know something even more amazing, Mindy Holt's (Min Reads) daughter Halle is the cover model! My thoughts: Josi Kilpack has a way of writing that the words seem to jump out of the pages of the book and I am caught in her story. I form pictures in my mind and become part of the story. Lenora is the overlooked sister. She is the introvert who would prefer to be behind the pianoforte, rather than conversing in front of it. She prefers to be in the background and has been overshadowed by her sisters. Feeling that marriage is out of her reach, she goes to Bath to live with her aunt and to teach music. It is away from her family that she feels the freedom to be herself and to be daring. It is a place where she relies on her own judgement and takes risks. This book is a companion book to "The Vicar's Daughter". It is helpful to have the background info from the first book, but not necessary to enjoy this book. It can be read as a stand alone. I hate to admit that I haven't finished the book in time for my blog tour stop. My final rating will be at least 4 stars, if not more. I am thoroughly enjoy it. A full review will be up soon.